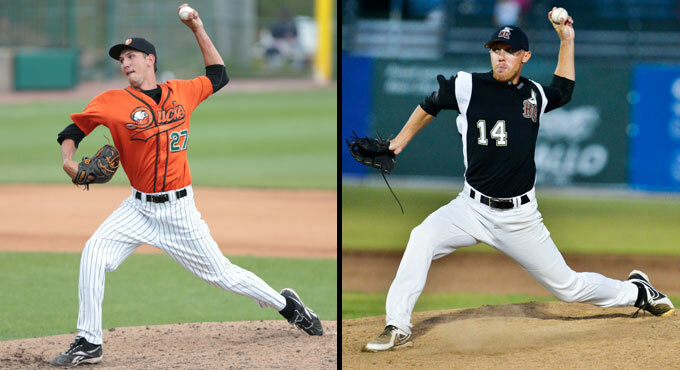 (Central Islip, N.Y., Feb. 23, 2015) – The three-time Atlantic League champion Long Island Ducks today announced the signings of left-handed pitchers Tommy Organ and Patrick Crider. Organ returns for his second consecutive season with the Ducks while Crider enters his first year with the Flock. “Tommy and Patrick give us two strong lefty arms out of the bullpen,” says Ducks president and general manager Michael Pfaff. “Both are coming off of successful seasons, and we are excited to bring them aboard for 2015.” Organ joined the Ducks in August of 2014 and found immediate success out of the bullpen. In 20 games, he compiled a 2.20 ERA and 18 strikeouts to just five walks in 19 and two-thirds innings. The left-hander did not allow a run in his first seven appearances with the Ducks and tossed 10 and two-thirds scoreless innings from August 27 to September 19. Prior to joining the Long Island, the 23-year-old began his professional career as a member of the River City Rascals in the Frontier League. He pitched in nine games (five starts) with River City in 2014, posting a 3-1 record, a 4.97 ERA, one complete game and one shutout. In addition, he struck out 26 batters and walked just 10 over 29 innings of work. The Florida resident played his collegiate baseball at the University of North Florida and combined to go 14-7 with a 4.09 ERA and 165 strikeouts in 60 games (35 starts) over four seasons. Crider comes to the Ducks with five seasons of professional baseball experience, all in the Frontier League. He spent the 2014 season with River City and compiled career best totals in wins (seven), ERA (1.43), games played (65), innings pitched (50.1) and strikeouts (62). In addition, Crider walked just 24 batters and held opponents to a .163 batting average. The Kentucky resident went on to toss two and one-third innings in the playoffs without allowing an earned run. The 27-year-old was also a member of the Rascals in 2013 and previously played for the Evansville Otters from 2010-13. He currently holds the Frontier League’s all-time record for games played with 237, and his 65 appearances in 2014 were the most ever in a single Frontier League season. Crider has accrued a career record of 17-7 with a 3.00 ERA and six saves. In that span, he has also amassed 212 strikeouts to just 95 walks over 195 innings of work.